I have been in the company of Royal Air Force representatives to mark the Battle of Britain. It is the season for various floral and horticultural events which has seen your mayor attend presentations at Harrogate District Allotment Federation, celebrations in Starbeck with the Annual Show, the In Bloom awards and a cheque presentation for a fundraising walk of some 85 sponsored miles by HBC Head Gardener Simon Collier and friends, all in aid of the Friends of the Valley Gardens and Starbeck in Bloom. The well-attended In Bloom event at York Racecourse saw Harrogate, Knaresborough, Pateley Bridge and Spofforth collect awards, which reflects the fantastic efforts of those priceless volunteers. Harrogate Autumn Flower Show displayed breathtaking blooms and a feast of nature’s larder, topped off by meeting Hacker T Dog who was causing the usual mayhem as seen daily on children’s CBBC. Continuing with the younger members of society, I met the young people of the National Citizen Service (NCS), which gives 15–17 year olds the opportunity to build new skills and face new challenges, when they invited me to their coffee morning fundraiser in aid of the children’s ward at Harrogate Hospital. And staying with the beverage theme I officially opened the Cup and Saucer coffee shop at Granby Care Home as it celebrates it’s ongoing refurbishment programme and it’s aim to welcome local people and community groups through it’s doors. I was invited to cut the ribbon at the official opening of the Darley shop and Post Office, which is an amazing achievement led by local resident Helen Flynn and her dedicated team of volunteers. 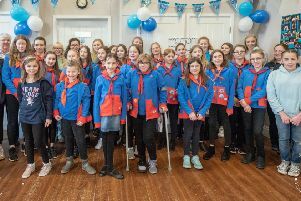 Moving on to the great outdoors, the girl-guides pitched their summer camp at Ripon Racecourse setting the theme of “It’s a Kinda Magic” with many Harry Potter references. No chance of getting bored at this extravaganza, thanks to the dedication of the Leaders, they are to be applauded. In preparation of the move to the new council building the Civic contents of Crescent Gardens are being catalogued with new homes found to display some selected items. The Harrogate Club is one such new home and during an impressive tour of the building local historian Malcolm Neesam was on hand to narrate the various historical points of reference. Pateley Bridge will also house a piece of cherished silver and it was pure joy to be back in the dale recently to see the 100 year old silent film ‘A Couple of Down and Outs’ ably assisted by pianist Mike Nolan introduced by Sir Sydney Samuelson, well done Nidderdale Chamber. There has been a flurry of new Reverends inducted at local Methodist and United Reformed churches with everyone in fine voice as the Mayor offered a warm welcome to the Harrogate Borough. And as we enter the period of Remembrance and wreath laying I have been in the company of the Merchant Navy and more recently the Royal Air Force acknowledging the Battle of Britain with a splendid reveille played by a young member of the Tewit Youth Band, you know who you are, take a bow young man.